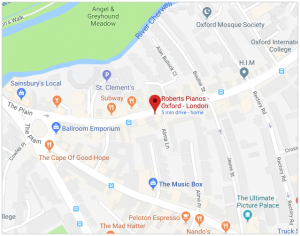 Roberts Pianos is fortunate to have tuned for concerts, universities, recording studios and our domestic clients for over 30 years. We recommend tuning every 6 months, to keep the piano at concert pitch (A=440). We provide our team of trained tuners in and around Oxford and elsewhere. We can also recommend piano tuners in many parts of the country. If the piano has not been tuned for a while, it may require pitch raising. Pitch raising, unlike tuning, is the art of stretching the strings in one go to be above A440. The art is stretching them just enough so that they fall back to A440. This is recommendable, especially if you play with other musicians. Our tuners can discuss minor adjustments all the way to full restoration as required to optimise the touch and tone. Restoration ranges from minor key tightening, double bouncing hammers, to hammer toning to change the tone, all the way to major re-pining/re-stringing, replacing the wrest plank and other major restoration. In most cases, at least a few minor adjustments are required. We can only tune pianos that are in the UK. e.g., when was the piano last tuned?